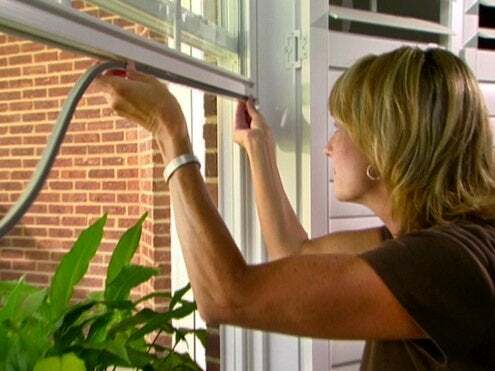 Weatherstripping your home is a fairly simple do-it-yourself project that can save you a significant amount off your energy bill, whether it’s cold or hot outside. The hardest part is choosing which weatherstripping to use. Older windows and doors are the first place you should check for gaps that can cause air leaks. On attic windows or other openings that aren’t used, installing heat-shrink plastic sheeting can be faster and more effective than weatherstripping. But for most windows and doors, you’ll need a strip of material that will compress to seal air out at the perimeter. V-shaped tension seals come in vinyl or metal. Tubular seals are available in rubber, vinyl, or silicone. Avoid using felt, which doesn’t hold up well in high-traffic or wet conditions, and closed cell foam products whose manufacturing process produces greenhouse gases. And don’t forget the bottom of your door. A door sweep or door shoe can help seal out drafts.